After reading these 4 posts, I must say I am a little worried... BUT, Xena and I are going to a Herding clinic. It is open to dogs of all types and ages. It is all day on Nov. 19th and whoever shows up (usually about 20 dogs) rotate in and out of the ring. The woman I spoke to was very encouraging. She had never heard of a Dutch Shepherd, but was excited to meet one. I figure for 30.00, it is not a bad way to spend a Saturday. they have, ducks, goat, sheep and cattle for all levels.... I will try to get hubby to take a video. Sounds like fun! Don 't worry too much about my horror story. It was a combination of a cocky person (the instructor) and me not having enough confidence to step in. Otherwise, I know Willow would have really enjoyed it! Tell us about yourself: I am currently the Secretary and Treasurer of the Dutch Shepherd Club of North America. We are the national breed club for Dutch Shepherds, and have the support of the Nederlandse Herdershonden Club in our endeavours to record the Dutch Shepherd breed in the United States and Canada through the American Kennel Club. dscna.com Join us on Facebook. Herding is fun for both of you! I've let all my dogs try it. So far, my female Malinois is the best herder. Those bossy woman get the job done! I wish it wasn't so hard to find sheep, though. BEWARE!!! Herding is addicting! Seriously. When you watch a herder do what they were bred for initially, it is awesome. Have fun, I know you will! Well, she LOVED it! My little girl, who is forever being told, "No, don't chase that" or "OUT! ", or "GET OFF THE CAT!" or "Leave the chickens ALONE!" was actually encouraged to chase and bite creatures. She had finally arrived at her idea of heaven. And the absolutely best part of the day was that she decided she liked dogs. ALL dogs (except that one giant female with the unfriendly glare)... But other than her, my normally reactive, hair up, growling lunging, barking nipping puppy decided that she liked them all. Wanted to play and hang out and meet and everything. ????? I don't know what happened but i am good with it! , then she ran them and was encouraged for it by the instructor lady. She's giving them the eye! Ok, I have to say there is a new purpose on that face! The sheep knew she meant business! And this is what happens after a day of herding!!!! Bliss! Everyone was very encouraging and she was off the charts happy. Twice, she actually stuck her head through that little fence and bit a sheep. She pulled a mouthful of hair. The instructor said "Wonderful!!! Good girl! 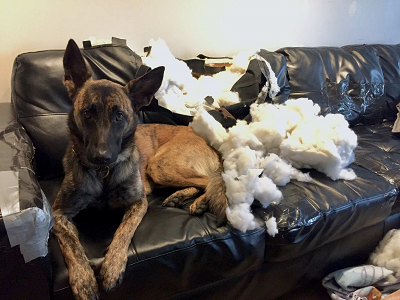 Usually it takes a ling time to get them to bite....." Hmmm, welcome to a Dutch Shepherd! :dswink"
This is absolutely GREAT! Great pics, great story! She felt amongst her own with purpose and is happy. Thats fantastic!!!!! Great pictures, she is so beautiful . I'm wondering how much it was for the session, and how often the sessions would be if you continued to do it. Now that's what I'm talkin' bout!!! Wasn't that fun!?!?! There really is an art to it sort of like a dance between the stock, the handler and the dog. For each action, there is a reaction. Reading stock by the handler while reading and instructing your dog at the same time will take some time but before you know it, you and the dog are like a fine machine running smoothly. So hang in there and please please post your progress and pictures!